MULLENDER: COME ON THEN, STOP ME! JOE MULLENDER WAS given prior notice that his name was firmly in the frame for a shot at the British title, but being tipped the wink did not prompt a scouting mission to assess the strengths of a potential opponent. 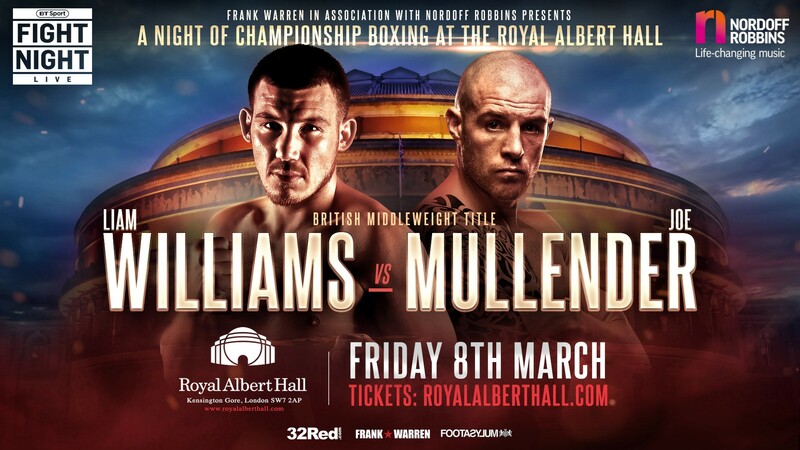 Mullender challenges Liam Williams for the British middleweight title at the Royal Albert Hall on Friday March 8 and the basher from Brentwood, known as Smokin Joe, had knowledge of the prospect before the Welshman claimed the title with an emphatic stoppage of the previously unbeaten Mark Heffron at the Manchester Arena in December. “I was at one of the award do’s with my manager Andy (Ayling) and Francis (Warren) and they just said to me ‘do you want to fight the winner?’. I said ‘how much?’ Done!” stated the 32-year-old with a record of 11-2. A pre-Christmas jaunt to Manchester was never on the cards though, according to the former English champion. “No, I’m not bothered, it really doesn’t bother me,” insisted Mullender. “I could have gone there and sat ringside peeping through the ropes. What difference is that going to make? “I can’t judge a fight and sit there wondering if I could exploit this or that. Listen, he’s gonna punch my head in and I’m gonna punch his head in. Game plans go out of the window so it is irrelevant to me who won because at this level everyone is a good fighter. “I know what I am good at and I know what I have to do. What he’s good at, he’ll do, so there is nothing special to it in my opinion. “I don’t feel like I had to sit there and watch it and I haven’t looked at it since either. I don’t need to, Liam is a good fighter and I am not one to sit and study and opponent. Williams is a world level operator who has previously challenged for an Interim title at super welterweight, as well as a final eliminator for a world title. Mullender, by contrast, admits his style is of a more basic nature and could be described as up close and personal. “Yeah and it is made for fighters like Liam, but my tactics are not going to change. I’m not going ‘I’m going to shock the world’ and then go on the back foot. I’m telling him in the press conference that I am coming to ‘ave it with him. “So he either irons me out or we are having a fight. It is as simple as that. “I don’t pretend to be something I’m not, but everyone can come and watch me or fighters of my style and think they will pick them apart. “I don’t know what he will do, but he can make it a very simple fight for himself by running, staying on the back foot and jabbing my head off. That is probably what Dom Ingle is saying to him, that I am basic and if I take too many he will stop me. “Come on then, stop me! “It is one thing looking at it from the outside and saying I am going to do this or that. When I am on your chest, try and stop me then. If you ain’t, I am gonna tickle your ribs and I am gonna beat you up.